A Gurn from Nurn: Nairn runs out of table salt - time for some 'out of the box' thinking? Nairn runs out of table salt - time for some 'out of the box' thinking? 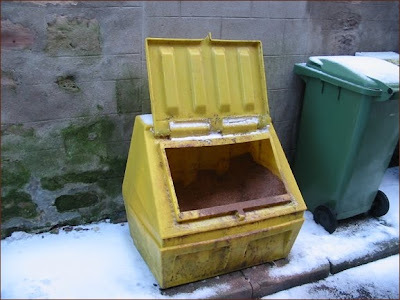 The yellow gritting box in Ballark place - many of these handy boxes around town are now empty too. Elected councillors are simply reduced to the role of axemen and women. So the next time we have bad weather a lot more men and machinery could have been paid off. What is to be done as the local authority's power to help its citizens and council tax payers disintegrates before our eyes? Time for a new approach? Could a body of volunteers be recruited? A network that could be used in times of weather emergency and alerted by text and e-mail. Contractors could deliver loads of salt to designated sites around the town and volunteers could spread the salt with shovels and barrows? What is the alternative for the future? Just give up and allow the elderly and those more vulnerable in our society to be prisoners in their own homes, with even the able bodied unable to walk safely on pavments or get their cars onto the diminishing number of roads that are open and safe to drive? If the council is in the process of giving up is it time for the citizens to take more responsibility? We used to get sand off the beach but you probably need a SEPA licence to do that sort of thing now! Good idea about volunteers helping out with the gritting. The box you photographed in Ballark Place was filled with new grit at my request because it was flooded with water before the snows arrived. The council roads staff did their job and re-stocked the box with dry grit and salt to keep Ballark Place clear. However on Christmas Day the pavements on the High Street Brae were so bad I got a bucket and shovel and spread the salt on both sides from top to bottom. I'm not saying this to gain any Brownie badges but simply to make the point there are many people out there willing to play their part if afforded the opportunity and resources when to be fair to the council workmen, they are fully stretched, or like the rest of us, enjoying their festive break. Public spiritedness is something we may not have entirely lost, but respect for our public services and their importance in society is something that we have. For the best part of the last 4 decades we have stood by and watched through boom and bust, still partying, whilst the fabric of society - quite literally - was breaking down. "I've got plenty of cash so I'm all right jack; it is your own fault if you are poor, sick, old - you should have worked harder, voted for x party..."
Well none of the politicians have solved the problems have they either national or local, you have to work hard to fight the worst excesses of human nature, and the 'better' politicians were just not strong enough to stand up to those who believe in greed. It is not until situations like these that we realise the impact on everyday lives and the risks to life and limb. Yes I think the idea of having plenty of salt boxes dotted around the town might be the best answer to slippy pavements. 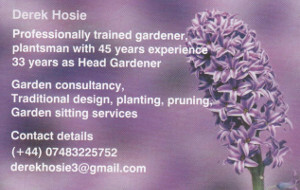 I saw Donald doing his thing on the brae and well done to him, the pavements that morning were lethal! I for one would be quite happy to spread some salt and grit when required. If he ventures down to Fishertown, he may get a few more.Sorry there isn't a bus (yet)? him with the video " TRUE GRIT "
I too requested my grit bin to be filled but of course it is now empty, and goodness only knows when it will be filled again. And I've been told that the side roads and pavements are not going to be gritted at all - I hope this isn't correct. Anyone else heard the rumour that one of the Nairn gritters had been scrapped and melted down to make more casings for council Blackberries? On this side of the pond we don't have the lovely Sand/Salt boxes They would be great to have around but our government has taken the route of making it illegal to not taking care of the sidewalk in front of your house or business. Also instead of using Salt/Sand a lot of communities are using a new sugar beet molasses and salt brine concoction that goes on very stickly but creates a very long lasting protection from the elements. It kind of smells bad but works wonderfully. "are using a new sugar beet molasses and salt brine concoction"
Further to my previous post, I phoned the Tec Services emergency number this morning, and by mid afternoon these gracious guys came and threw grit all over my hilly car park and filled the grit bin too. Many thanks to them. the guys are doing their best as always. and i wish them all a good year its not their fault all these cut backs are going too hit us all at some point. some tough times ahead folks. Agree with that GTsow, the front line guys are working very hard in hazardous conditions and we should thank them for it. The cuts are not made by them, all the flak should go to the councillors and the gaffas with the bramble phones. 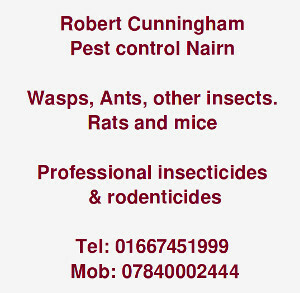 One angry Nairn resident described the conditions in his area as "absolutely atrocious". "The pavements are covered in snow and ice," said the man, who lives in John Street. "Since the weekend before Christmas nothing has been done. I tried to contact the council's emergency number but the voicemail was full. I would like the council to explain why we pay our Council Tax." 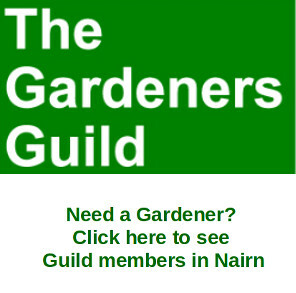 Angry of Nairn should try contacting the Nairnshire and then harassing their local councillor, that's how one fishertown wifie allegedly got her driveway gritted!